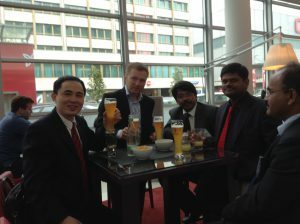 On May 15, 2013, on a long business trip to Geneva, Switzerland, Dr. HoaAnh had a meeting with many customers and partners. Dr. HoaAnh had anin-depth and detail discussion with Mr. Peter Jandziak from Finland and the CEO of EuroPharma Alliance Sp. z o.o. and other customers from India. All these customers were very interested in Anabio’s breakthrough products and they also realized the necessity of these special products for their countries.